Ancient Rome went through various phases of governance and political systems throughout its existence. But while there were dramatic changes at the top of the government structure, not much changed in the way Rome was governed. With the expansion of Rome, new changes had to be brought about and new adjustments made in the government system. The Roman government was a kingdom before it was declared a republic around 500 BC. With the passage of time, government of ancient Rome evolved to absorb various internal and external changes. In the earliest days of ancient Rome, it was a kingdom ruled by a king but this phase of government was short-lived. Rome was declared a republic around 500 BC which meant that more people were involved in running the affairs of the state. During the era of ancient Rome as a republic, the people who ran the affairs of the government were called consuls. They were responsible for making decisions on wars, taxes, and the various laws that needed to be passed. Rome became an empire in 27 AD when Augustus Caesar became the emperor and this once again brought about changes in the way the government was managed. The governing system of Rome in action. The structure of the ancient Roman government varied somewhat during the days of Republic and Empire. In the former type of government, there were two consuls who decided the affairs of the government and it was necessary that they agreed. The consuls were in turn advised by the Senate which mainly consisted of the elite class of Rome. The changed that occurred when Rome became an empire was that the emperor had more powers than the consuls and there was a single man in charge as an emperor. People who were members of the senate retained their membership for life. Women in ancient Rome were not eligible to hold any public office. Roman government system can be considered a mix of a republic and a democracy. Their ideas of governance were heavily inspired by ancient Greece. The elite body of the the Roman government system was the Roman senate which remained more or less the same in its composition even after Rome had transformed from a republic into an empire. The idea of separating the government system into three branches of executive, legislative, and judicial also took birth in ancient Rome. An addition after the declaration of Rome as an empire was that the emperor had the right of veto. There were assemblies which consisted of all the Roman adult men who chose their tribunes. These tribunes had a right to veto the laws passed by the senate, which frequently happened. A striking feature of this system was that women were kept out of it. The most important position during the days of Roman Republic was that of consuls. With the establishment of the Roman Empire, this became the position of the emperor. However, the responsibility of making laws resided with the senate and the members of the senate were also at a position of considerable power, particularly because the consuls and the emperor needed their support to retain his position. In the provinces, there were governors who had a considerable degree of power to run the local affairs. On a city level, there were prefects who managed the day to day affairs of the cities. 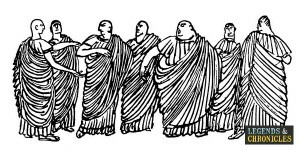 A senate of officials from ancient Roman times. How were government laws made and enforced? The main legislative bodies that passed laws under the government were the senate and the assembly. The senate was more of hereditary body with a member retaining his membership for life. Assembly, on the other hand, was representative of all the adult males in Rome. 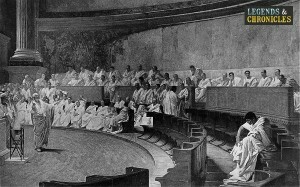 After the creation of the Roman Republic, the actual assembly known as Curiate Assembly was divided into two assemblies called a Tribal Assembly and Century Assembly. With the passage of time, most of the legislative powers were transferred to another assembly called the Plebeian Assembly which passed laws, elected magistrates, and tried judicial cases. The Senate, on the other hand, could pass the laws but the Assembly could simply veto these laws. The enforcement of the laws passed by the government in ancient Rome was the responsibility of the urban police known as ‘Vigils’. They were responsible for maintaining laws on the streets of Rome, keeping a night watch, and acting as fire fighters. They also apprehended thieves and robbers and also captured runaway slaves. During the reign of Emperor Alexander Severus, they were also delegated the responsibility of guarding the public baths which remained open at night. There were other police forces as well, such as Cohortes Urbanae which handled sedition, riots, and violent crimes. For these bigger crimes, Vigiles provided a supporting role. The Roman Empire lasted from 27 BC to 476 BC which was a period of just over 500 years. During this long period, the empire expanded to include areas of Western Europe, North Africa, and Asia. There were various reasons for the collapse of the ancient Roman government and empire. One of the most important causes behind the collapse was the antagonism behind the emperor and the senate and it was very frequent that both were at odds with each other. Other reasons for the collapse of the government included political corruption among the elite classes, too much dependence on the slave economy, an over-expanded empire which was hard to manage, constant invasion of barbarians from the North, increasing unemployment of the working classes, and others. The Roman government went through various phases over the course of many centuries of its existence, although salient features of the government structure remained more or less the same. For instance, one of the most important features of government in Rome was the senate which remained functional in the republic as well as Empire. Additionally, there was an assembly where all adult men could elect their representatives and which could veto the laws passed by the senate. The laws were then enforced by the urban police and guards. With the passage of time, antagonism between the emperor and the senate continued to increase and this, along with other problems, caused the collapse of the Roman government.